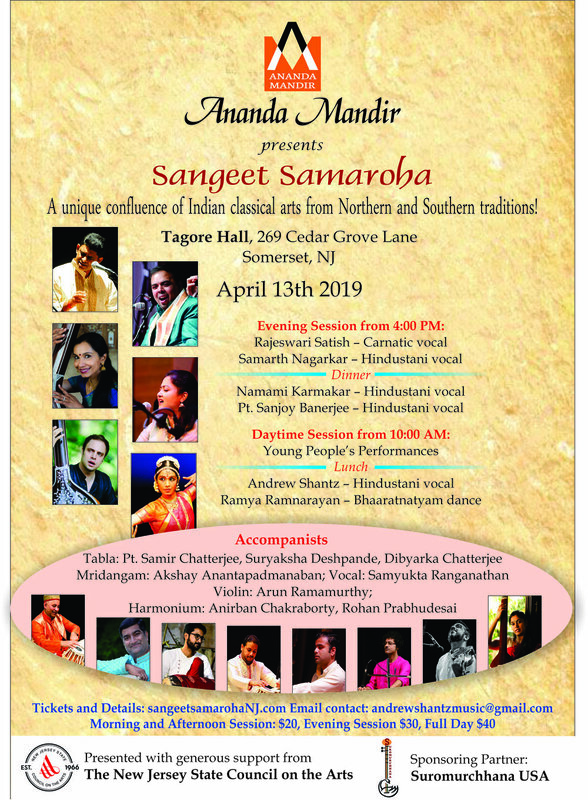 Conceived of as a vehicle to present the wide spectrum of South Asian classical performing arts taking place in New Jersey - and funded in-part by a generous grant from the New Jersey State Council on the Arts - Sangeet Samaroha 2019 will feature many of the world-class performers of both Hindustani and Carnatic music and Indian classical dance that live and perform in our area. Hosted by Ananda Mandir at its beautiful concert venue, Tagore Hall, attendees will be able to enjoy an extended experience of the Indian classical arts. With talented student performances in the morning, up-and-coming artists in the afternoon and eminent, sought-after artists from evening until night - with lunch, dinner and snacks available - arts lovers will see the broad scope of the impressive musical and dance offerings available in New Jersey.